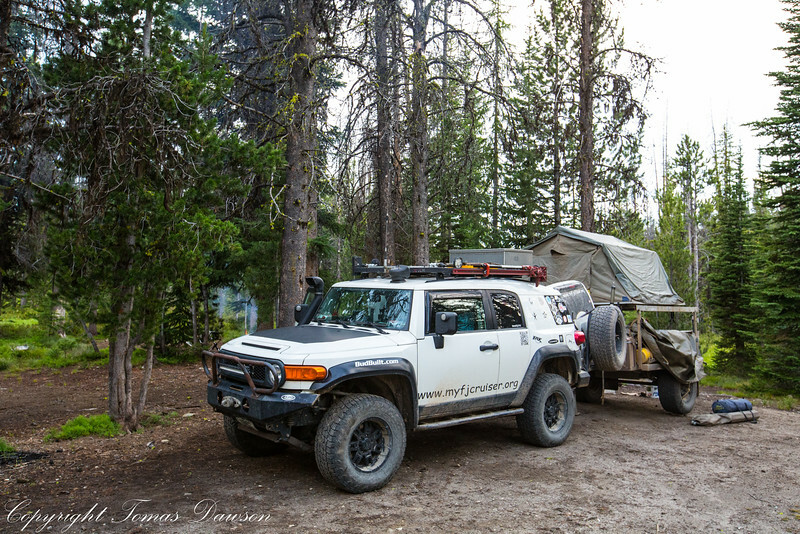 Making our way from Montana to Idaho on the Magruder Corridor provided a classic remote back-country experience. I have been eyeing the Magruder as a possible back-country adventure for the last 8 years. Finally, with our daughter living in Missoula, Montana we had the opportunity to take on this route during our summer road trip. With fires burning all over the west our plans were not definite until the day prior to this leg. With one fire burning near Hamilton, Montana, access to the Magruder was questionable. InciWeb provided us with access to current information on this and other fires that might impact our plans. I used this site to verify that we could now access the Magruder. The Magruder had just opened after a long delay this spring due to a mudslide and a section of road needing to be reconstructed. Shopping done and our goodbyes said, we headed south on Highway 93 from Missoula towards Darby, Montana. (The Magruder can also be accessed from the south on the same highway). 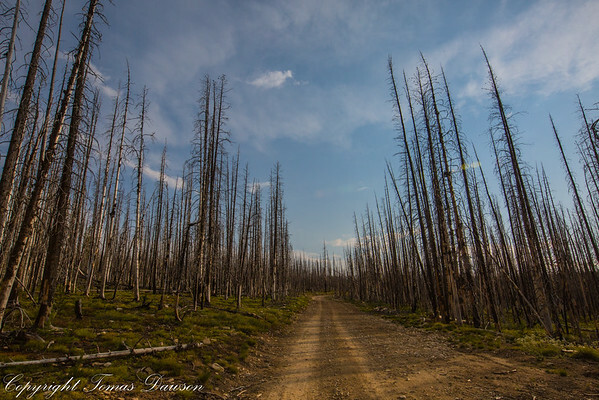 Passing through the burn area was a little eerie with smoke still hanging in the air and speeds reduced to 45 mph for the safety of firefighters. A few miles south of Darby we turned west off the main highway onto road 493. 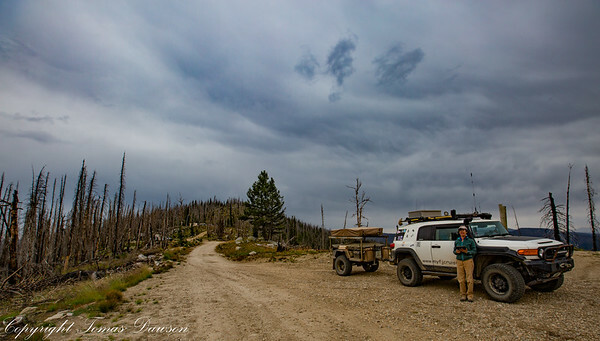 The road is “paved” for the first 30 miles which ends near the Montana, Idaho border, on Nez Perce Pass.This paved road to nowhere had purpose, the intention was for paved access to logging trucks that never drove the route due to the wilderness areas being created. 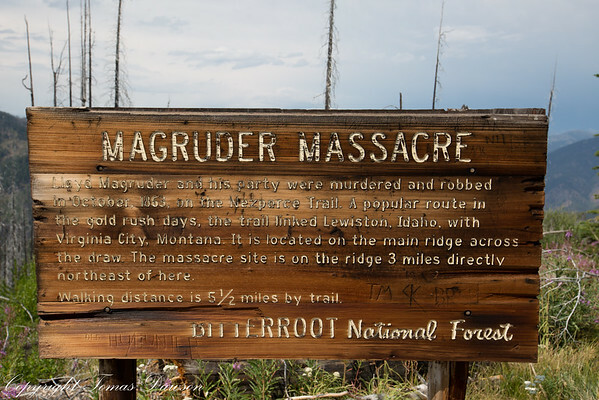 The Magruder is a motorized corridor that passes through one of the largest combined wilderness areas in the lower 48. With the Selway Bitterroot Wilderness to the north and the Frank Church River of No Return Wilderness to the south the preserved lands make up a total of over 5 million acres, the largest wilderness outside of Alaska. The corridor passes over 100 miles through this remote landscape. 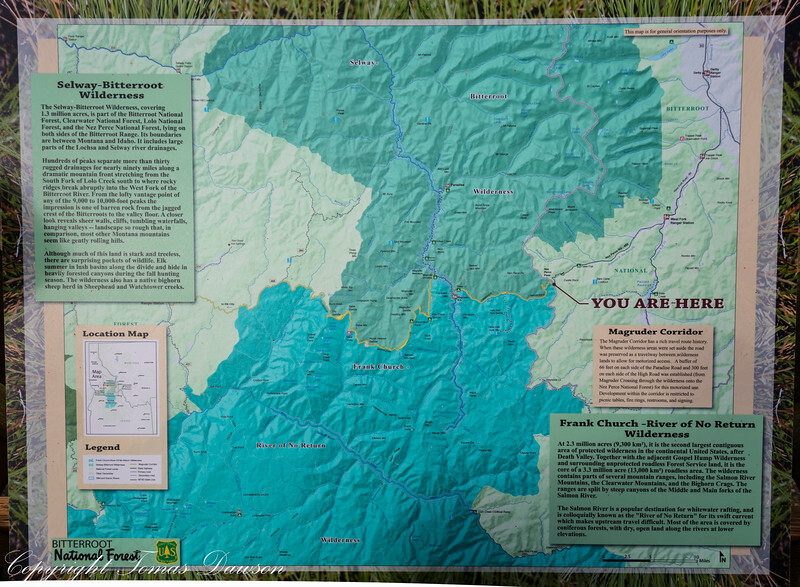 The Magruder Corridor, also known as the Nez Perce Trail has a long history of human passage. 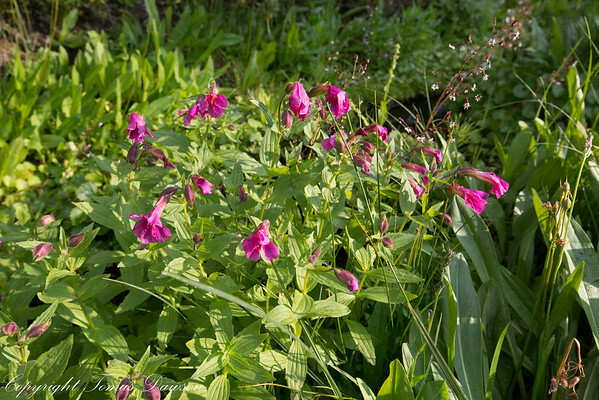 Starting out as the part of the Southern Nez Perce Trail the route was used by Native Americans to move between their homeland in what is now known as Idaho and their buffalo hunting grounds east of the Rockies. In the 1800 the route was discovered by trappers who started using it as a path over the continental divide. After gold was discovered in Elk City, Idaho route use increased. In the Early 1900 road building had begun along the route and in the 1930’s the CCC took the route on as a project and constructed much of the road as it remains today. The route was key to the forest management and the establishment of the fire lookout stations along the way. The namesake for the corridor is Lloyd Maguder. In 1863 was returning from Virginia City, Montana to Elk City, Idaho and was carrying a fortune in gold dust. 4 travelers that joined him on this return trip attacked him along the route. After murdering him and escaping with his gold they fled to San Francisco. Hill Beachy, a friend of Magruder, pursued the men and returned them to Idaho to face justice. Three of the men were found guilty and executed by hanging on March 4, 1864. 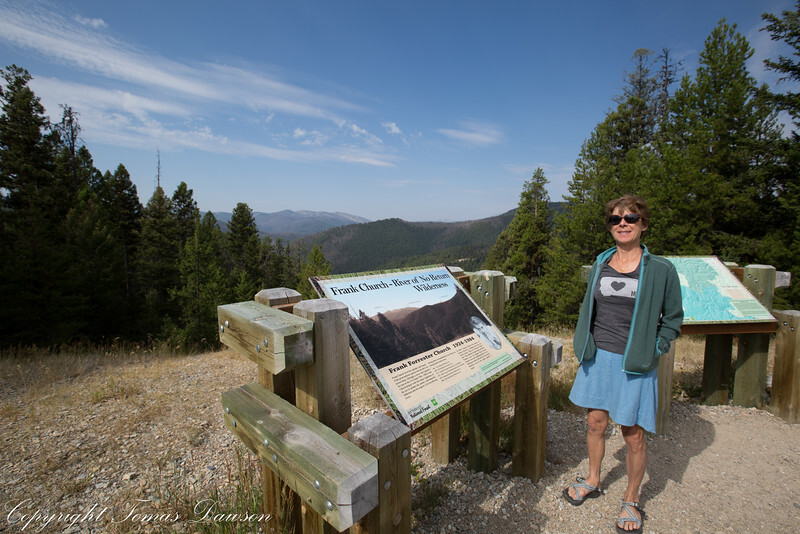 Our first notable stop was on the Continental divide where the road passes from Montana into Idaho and the Pacific watershed. 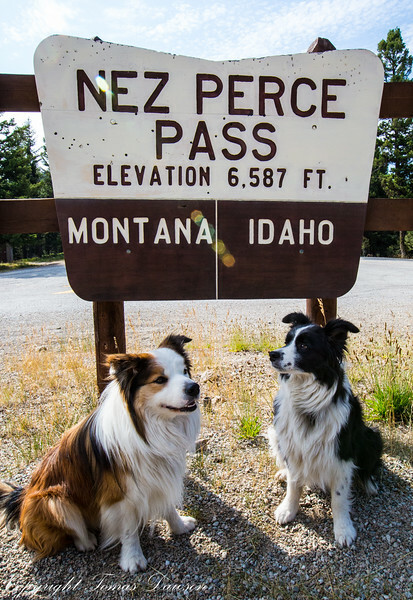 Nez Perce Pass is at 6598 feet and provides a spectacular view of both wilderness areas. After a short stop to stretch the legs and let the dogs run we continued our journey west. Descending to the banks of Deep Creek the route follows the twists and turns of the deep canyon. Having read about the possibility of seeing fire lookouts we took our first opportunity and followed the Hells Half Acre Lookout road, #224. Twisting and winding we climbed the steep ridge lines making our way 11 miles south. The road travels through numerous burn scars and finally tops out at Hells Half Acre Spring which rests in a saddle just east of the lookout. There is camping available here if you are ready to make your stop for the day. 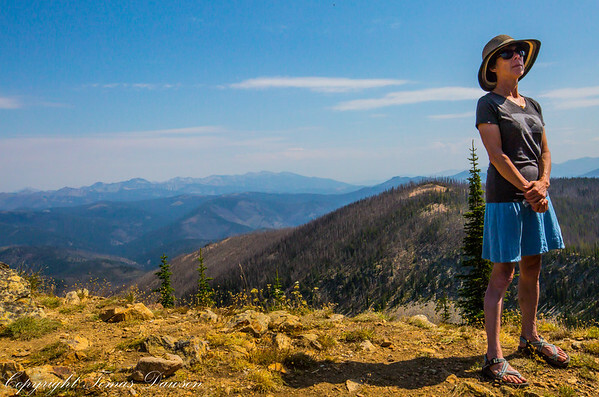 Perched on top of Hell’s Half Acre Mountain at 8110 feet the lookout has a spectacular view. A husband and wife team have staffed this lookout for over 20 years and shared some great stories with us. If you stop here, remember that the lookout is their home and not open to the public. However, take the time to listen the the stories the couple has to tell about their years on this desolate knob. With the weather changing and storms moving in it was time to head back down into the canyon. The drive down was uneventful, and thankfully I did not encounter any oncoming traffic which would have required getting our rig and trailer out of the way. Back on the Magruder we continued our trek west. Very few side trips are available along the corridor, most of which we took. The longest we decided to forgo as it was getting late and we needed to find a camp for the night. If you desire you can follow the Selway river north to Paradise Campground which adds an additional 12 miles (24 miles total) to the trip. At the Magruder Crossing we rumbled across the old iron bridge and the road began its long climb from the Selway river to top out at Observation Point (a climb of 3500′). The views from Observation Point are spectacular looking back east over the corridor and the wilderness that surrounds it. Choosing a site in the primitive campground we set up camp for the night. Dispersed camping is available as is an old rickety outhouse. The sunset was breathtaking and some generous travelers had left us wood for a warming fire. 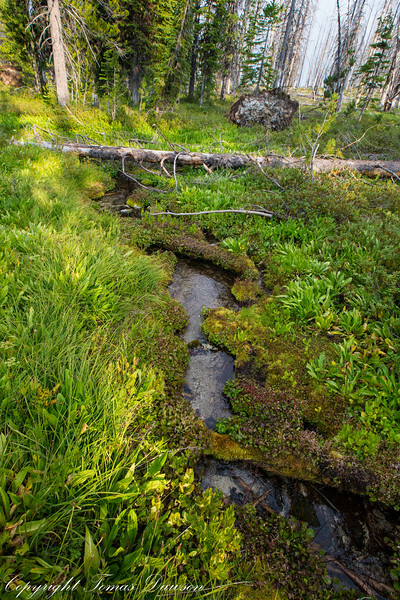 Our site for the night was right next to a really cool subalpine wetland area with moss growing all over the place and numerous wildflowers. Heading to bed with the stars overhead in the remote wilds is what I dream about. With no one else in the remote campground we enjoyed the wonderful silence the wilds bring. The only thing missing was the howl of wolves drifting in on the wind. I know the’re out there just not for us tonight. We did get a few light shows from the storms moving through. A breakfast of blueberry pancakes and bacon was enjoyed under crisp blue skies. 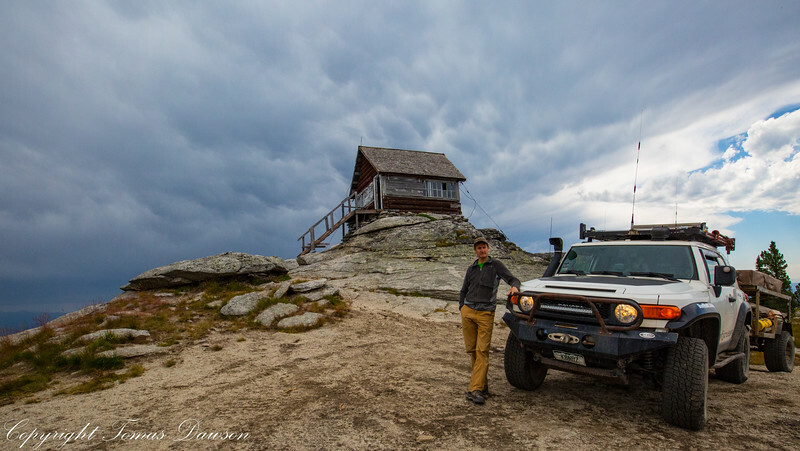 With the ease of packing the roof top tent and the cooking boxes we were off and running with our first objective being a hike to the Salmon Mountain fire lookout. 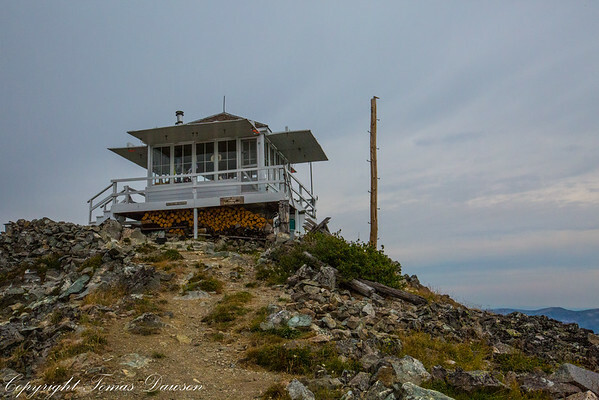 With the fire lookout built prior to the creation of the wilderness the trail is an old road cut that climbs about 1 mile up and along the ridge to the lookout. We took about 45 minutes to make the to the lookout which rests at 8192 feet. Our dogs loved the hike and we were welcomed at the lookout by a seasoned volunteer. Unlike the Hells Half Acre lookout, we were welcomed into the building and given a full tour of the one room facility enjoying the spectacular 360 degree view. 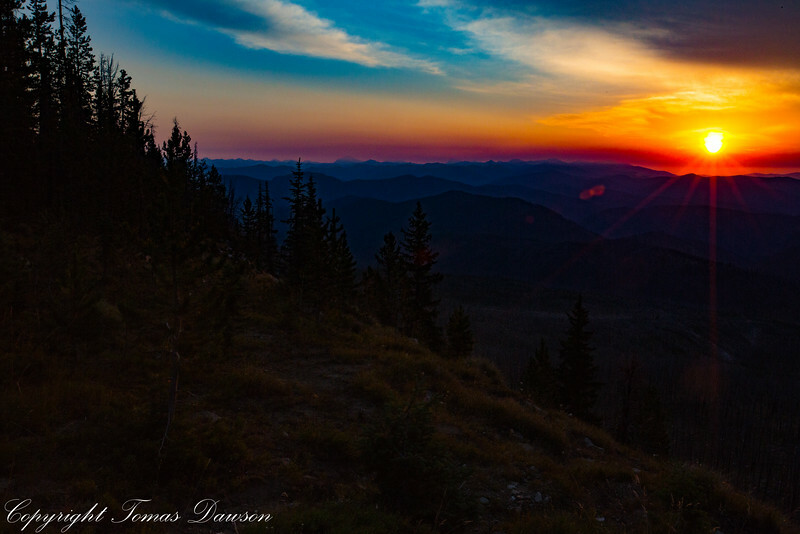 This morning the lookout was watching a new lighting fire start a few ridges over. The fire had been called in and was being monitored for growth. 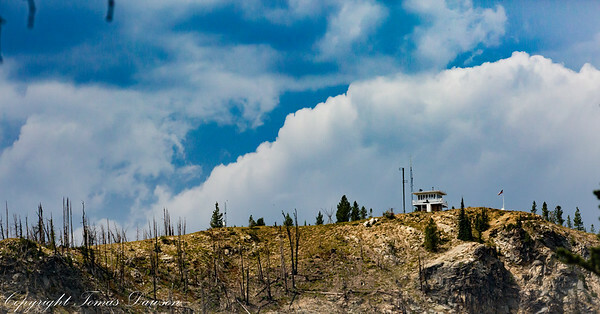 If you have any interest in fire management the lookouts are a great place to stop and learn about spotting. 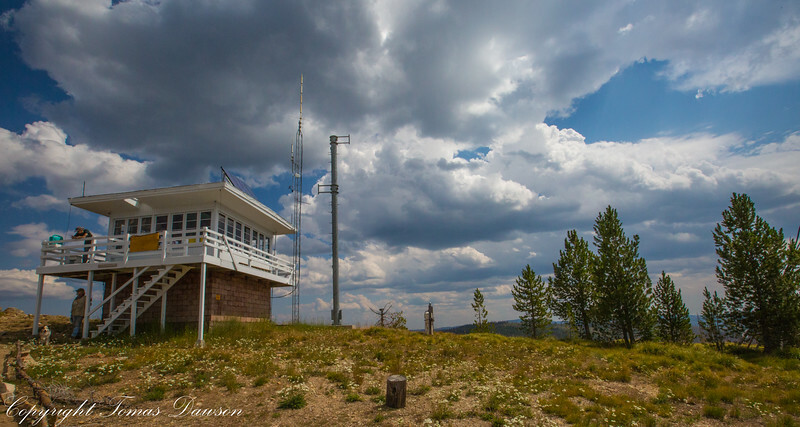 The vast wilderness of the northern Rockies is one of the few places in the US that lookout towers have not been fully replaced by satellites, planes and other technology. 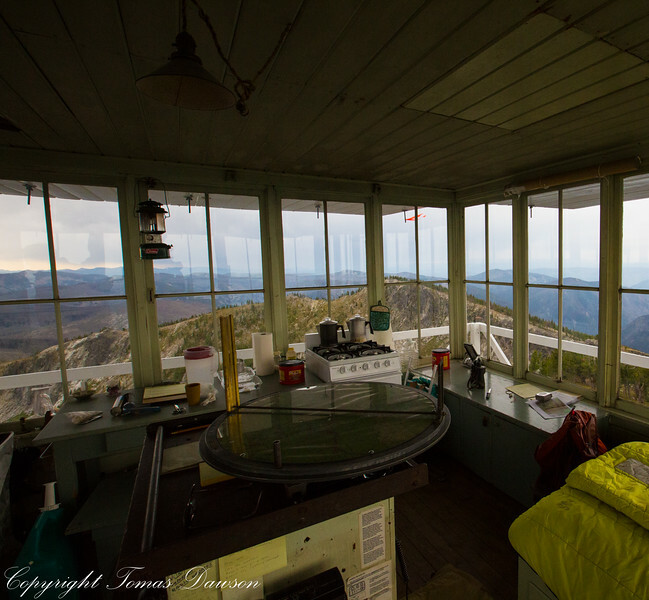 The technology in the fire lookout towers has not changed much in the last 100 years. The maps are a little better and communications are now done with radio and sometimes cell phones, but the technology used to spot the fire is the same, get a vector, have another tower triangulate and call it in. Grey clouds looming and rain on the horizon it was time to leave the tower and head back down to the truck. Heading west we started to experience the narrow rocky path the Magruder is known for. One can see the road on the horizon as it heads back up and over the next ridge line. 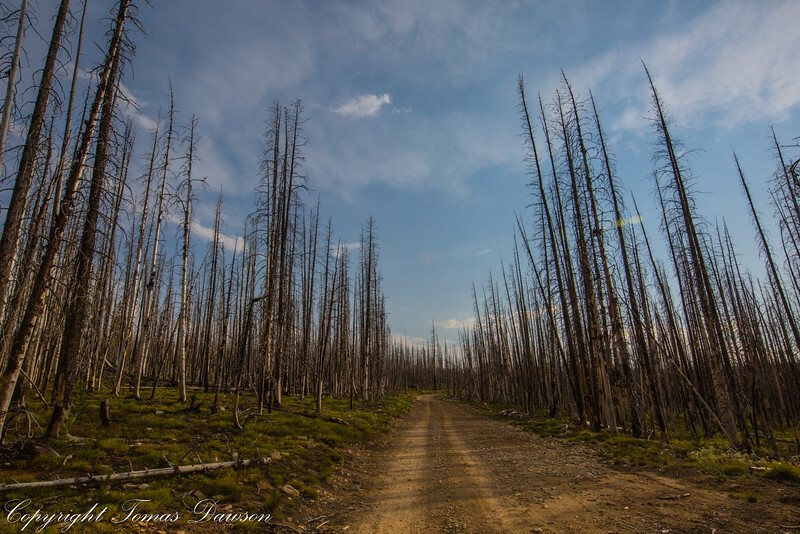 It seems like the road travels from one burn area to the next with little strips of unburned forest in between. Burnt Knob, just the name sounds, ominous, was our last lookout of the trip. 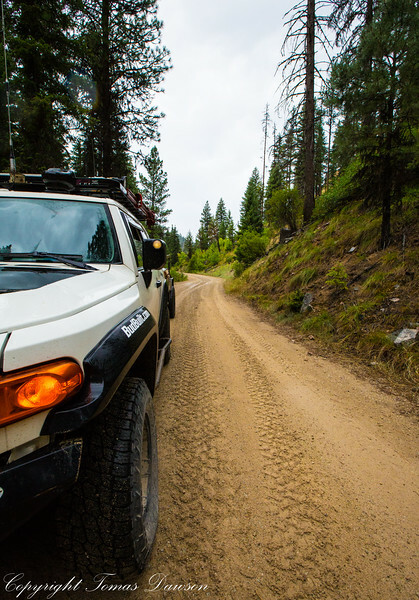 The road to Burnt Knob is a narrow, steep, high clearance road suited to rigs like ours. With the trailer in tow we climbed the steep narrow road feeling like we were headed to the clouds. Rounding a ridge we could finally see the lookout perched on the rock knob ahead. From the Lookout the view is spectacular in all directions. This lookout is no longer in use but is being preserved as a historic site so please take care of it if you stop by. After a short stay we headed back to the main route and continued west. We passed a number of great camping area and the road started to improve. We also passed through the most recent burn scar where we stopped for lunch in a decimated campground where all that was left standing was a single plywood outhouse and the sign. We continued west and started to lose altitude as we headed towards the end of the Magruder Corridor. If you make this trip be prepared. There is NO fuel between Darby Montana and Eagles Nest which is a total of 126 miles. Even there, the one gas station might not be open so expect to drive 51 miles more to Grangeville, Idaho. With the remote nature of this road it is possible to get turned around at any point so double the fuel is recommended. 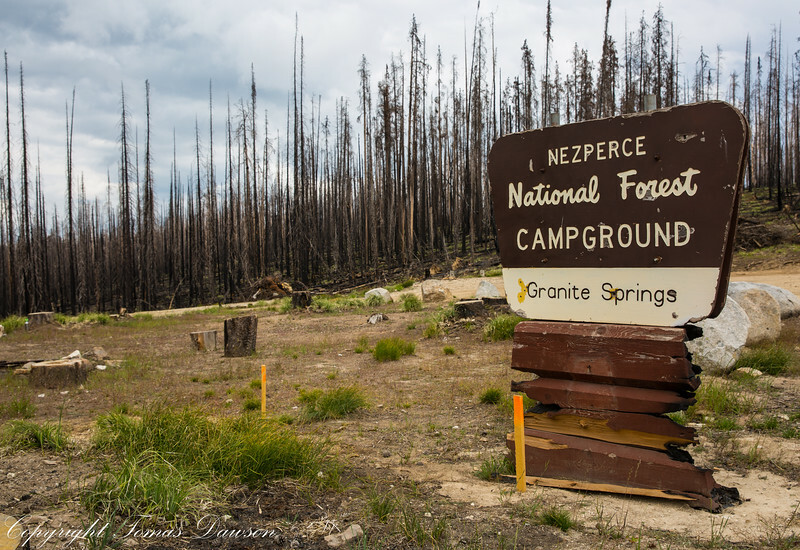 There are lots of places to camp along the way, just be sure to use an existing site and an existing camp fire ring. Be aware of fire restriction and plan accordingly. With this being a very remote section of road I recommend checking conditions the day you head out. There is also a great guide available from the forest service for the corridor. Take your time and spend a night along the route. Check conditions before you go here.